After a blustery Thursday, winds should begin to wane Friday, making for a cool, calm and dry end to the workweek, according to the National Weather Service. The morning low is forecast to reach 59 degrees, while the high is predicted to hit 80 degrees. After a blustery Thursday, winds should begin to wane Friday, making for a cool, calm and dry end to the work week, according to the National Weather Service. Residents can expect gusts in the morning, but “by the afternoon, it will seem like a regular day” with 5 to 10 mph breezes, said Dan Berc, a meteorologist with the weather service. Friday should see a morning low of 59 degrees and a high of 80, Berc said. Saturday and Sunday should see warmer temperatures, with expected highs of 86 and 87, respectively. Berc said it should also remain dry throughout the weekend, with no expected rain throughout the duration of the Life Is Beautiful music festival in downtown Las Vegas. Looking into next week, temperatures may climb to 90 degrees by Wednesday, Berc said. 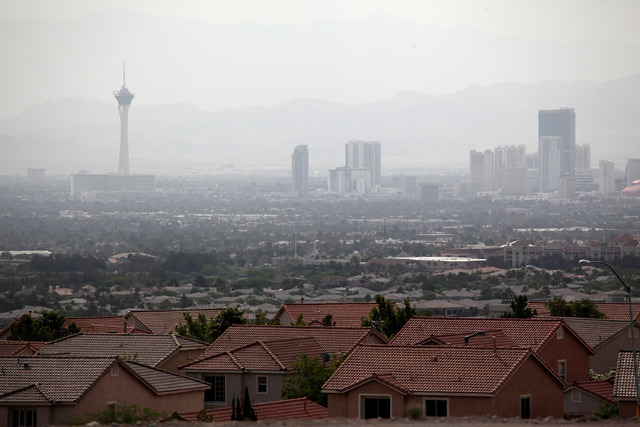 Winds that reached 50 mph in the valley Thursday prompted the weather service to issue a wind advisory and the Clark County Department of Air Quality to issue a dust advisory. A red flag fire warning was also in effect. The Clark County Department of Air Quality issued a dust advisory Thursday for elevated levels of blowing dust caused by high wind speeds. The advisory is in effect through Thursday night. Review-Journal reporter Rachel Crosby contributed to this report. Contact Max Michor at mmichor@reviewjournal.com or 702-383-0381. Find @MaxMichor on Twitter. For more on current conditions in Las Vegas and forecasts, see the updated graphic below or go to our weather map.